The Great Grand Tour,’ just the phrase conjures up images of steamer trunks and sojourns in chateau while sipping champagne in the Alps. The reality isn’t far from your wildest imaginings, beginning in the 17th century, when portions of Europe were relatively peaceful, men and women began to travel throughout Europe and the more adventurous into Africa and Asia. By the beginning of the 18th c, knowledge was widely considered to be the sum of experience and the ‘Grand Tour’ became an important part of an individual’s education. The ‘Tour’ could last several months or several years depending upon the means of the traveler and it was expected that regional Books, Fine Art, Jewelry and Sculpture should be collected and upon return shared and spoken about to educate those less fortunate who had to stay at home. There was a typical itinerary through Europe but more adventurous travelers pushed further into exotic locations. 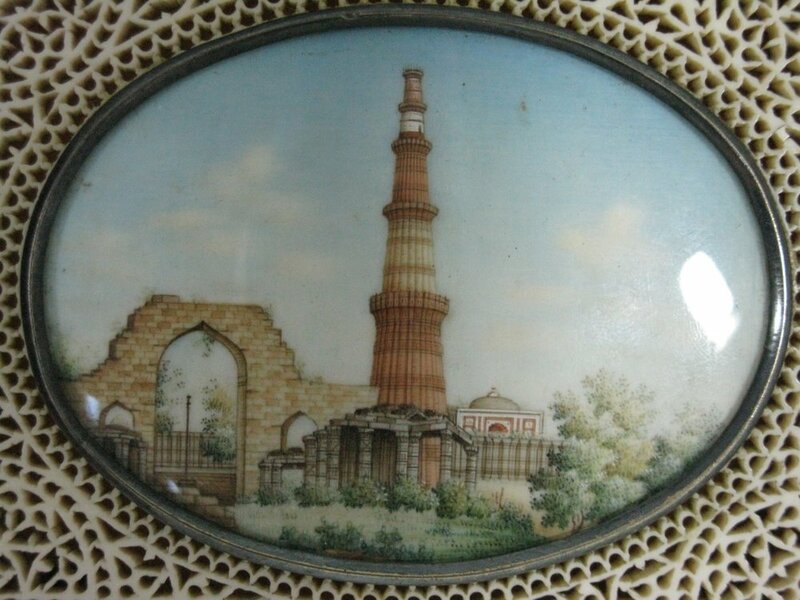 In the 19th century, without the technology to take a ‘selfie’ in India at the Taj Mahal, the enterprising traveler would have purchased this carved ivory box, mounted with eight miniature paintings of cultural landmarks; a useful treasure which would have informed and delighted upon return. In Africa? 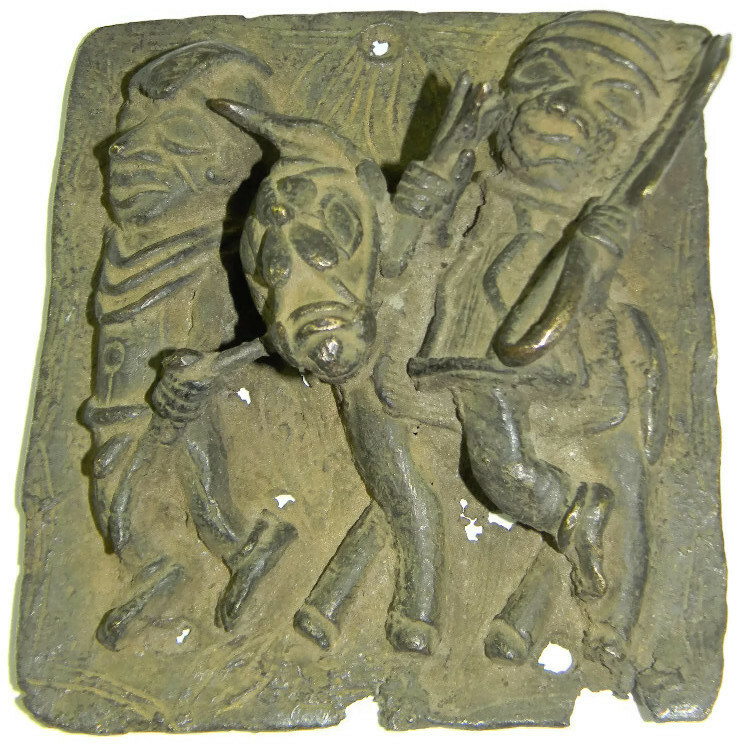 One might have brought back cast bronze architectural plaques from the Benin tribe, wholly unlike the Western tradition of bronze statuary. Of course, items change with tastes and more contemporary examples of Grand Tour souvenirs include this group of exhibition tickets and souvenirs from the X Olympiad in Los Angeles, CA and the Golden Gate International Exposition, ranging from 1932 to 1940. Exhibition tickets and souvenirs from the X Olympiad in Los Angeles, CA and the Golden Gate International Exposition, ranging from 1932 to 1940. Travel further south into Mexico and one may have purchased this sterling silver four-piece jewelry suite made by Mexican silversmiths in the 1950s – 1960s. Vintage Sterling Silver Mexican Multi-Chain link set including necklace, earrings, bracelet and brooch. Then and now, these objects become the starting point for conversations about different cultures and time periods – while the 20th and 21st centuries find ‘Grand Tours’ rarely executed on the same scale as previous eras, cultural souvenirs are still an important part of sharing the human experience. Interested in more items from the Great Grand Tour? E. M. Wallace Auctions & Appraisals is excited to present our ‘Great Grand Tour’ Auction, November 27th at 2:00pm EST where you will have the opportunity to bid and win items for your own fantastic journey. Absentee bidding is open now at www.LiveAuctioneers.com and www.Invaluable.com.